TomTom PRO 9150 TRUCK features a 5-inch display and is pre-installed with mapping for 45 countries across Europe. In addition you can simply turn the TomTom PRO 9150 into a portable fleet management system. Subscribe to WEBFLEET and connect your TomTom PRO 9150 TRUCK to the office for smart dispatching, tracking en time management. Diversions, rerouting and size restrictions: every day your drivers face a bewildering number of challenges to get the goods through. TomTom PRO 9150 TRUCK uses smarter navigation to plan better routes for your drivers. They are less likely to get stuck, delayed or drive unnecessary distances - meaning efficient journeys and accurate scheduling. TomTom PRO 9150 TRUCK has been discontinued. TomTom PRO 9150 TRUCK featires a 4.3-inch display and is pre-installed with mapping for 45 countries across Western and Central Europe. In addition the TomTom PRO 9150 TRUCK provides access restrictions in 22 European countries, routing around known dimensional, weight and hazardous materials restrictions. Your trucks are large, now your satnav is too. The new TomTom PRO 9150 TRUCK has a 5-inch/13cm screen that makes navigating your trucks even easier, giving clear visual instructions to guide your drivers around restrictions. With the TomTom PRO 9150 TRUCK your vehicles are less likely to get stuck, delayed or drive unnecessary distances - meaning efficient journeys and accurate scheduling. And your drivers are more relaxed using an extremely easy to operate navigation device with large screen. And the best thing is... you can simply turn the TomTom PRO 9150 into a portable fleet management system. Subscribe to WEBFLEET and connect your TomTom PRO 9150 TRUCK to the office for smart dispatching, tracking en time management. Start driving with the latest map - guaranteed! If a new map for the TomTom PRO 9150 TRUCK is available within 90 days of first use, you can download that map once for free via http://business.tomtom.com/getstarted. With the TomTom PRO 9150 TRUCK you save money by, using the fastest route and route calculation and avoiding idling with IQ Routes, you'll be efficiently on the move avoiding worker downtime. TomTom PRO 9150 TRUCK can be part of TomTom WORKsmart solutions - for effortless fleet management. No additional hardware is needed. The TomTom PRO 9150 TRUCK has an integrated SIM so you can hook up to WEBFLEET effortlessly. *Requires a subscription to WEBFLEET. The LIVE services require a Live subscription to TomTom WEBFLEET. TomTom Weather gives you local daily and five-day forecasts on the TomTom PRO 9150 TRUCK, helping you make plans based on the weather. You can also find out about road conditions to make sure you get to where you're going safely. TomTom Local Search with Google helps drivers find whatever they're looking for, wherever they happen to be. Just type in any search word and the Google application will list all the hits in the local area, including the approximate distance from your present location. Select the one you want and the TomTom PRO 9150 TRUCK will take you there. Simple. TomTom PRO 9150 TRUCK mounts on the inside of your vehicles windscreen using the suction cup windscreen bracket provided. TomTom PRO 9150 TRUCK can be powered directly either from its internal battery (for up to 2 hours) if it's fully charged or powered from the cigarette lighter socket. 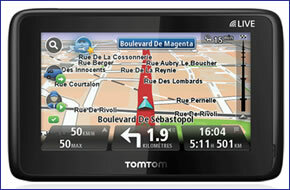 The TomTom PRO 9150 TRUCK sat nav comes with the latest and most complete maps of Western and Central Europe. Door-to-door accurate navigation anywhere across the continent. Which in addition to street information include features such as route calculation, Points of Interest, Estimated Time of Arrival, and TomTom Map Share technology. TomTom’s unique Map Share technology enhances your navigation experience, because you can now make instant changes directly on your map. TomTom Map Share technology allows you to make corrections to your own map and benefit from thousands of corrections made by TomTom users every day - free of charge.